STILLWATER — Colin Simpson is not a guy a pitcher wants to see with the bases loaded in a tie game. 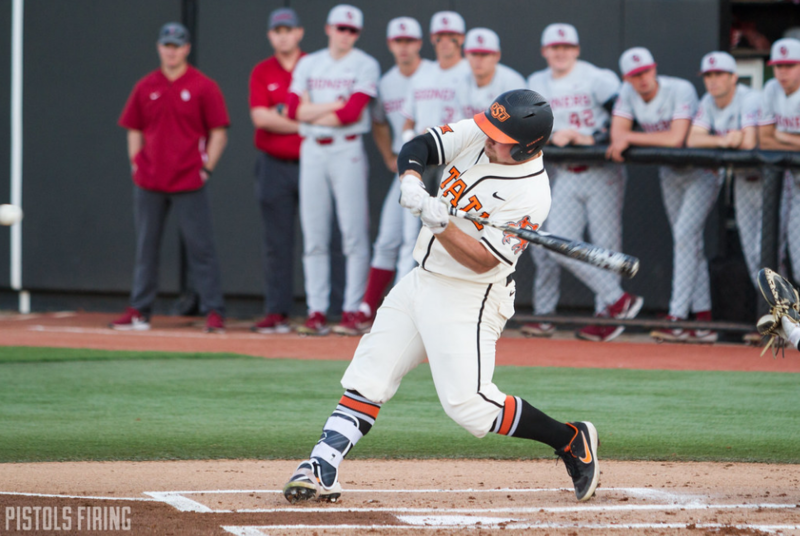 The Oklahoma State baseball team defeated West Virginia 9-5 on Saturday after Simpson belted a go-ahead grand slam in the eighth inning. The Cowboys were able to come back from a 5-0 deficit after getting drilled 11-1 on Friday. The win sets up a rubber match Sunday, with first pitch scheduled for noon. Here are five thoughts from Saturday’s game. With two outs and the bases loaded, Colin Simpson dropped some hail on Duck Street. The home run was Simpson’s eighth against West Virginia in his career. During the 30-minute weather delay before the game’s start, Simpson said WVU pitcher Sam Kessler, who Simpson got to know at the Cape Cod League this summer, told him that Simpson has a quota of two home runs he has to get against the Mountaineers. Simpson said Kessler asked that Simpson didn’t hit any off him. Simpson denied said request. The moonshot came off the first pitch Kessler threw Simpson. Simpson said Kessler throws a lot of sliders, and he was waiting on it. Simpson said with there being two outs, he was swinging for the fences. Simpson is known for his home runs, but it was only his fourth this season. After the game, OSU coach Josh Holliday called Simpson a marked man because teams were pitching around him to avoid giving up big plays. With the bases loaded, though, the Mountaineers had no choice. Before Saturday’s game, NCAA home run king Pete Incaviglia met with the Cowboys, and something from that meeting stuck out to Simpson. All Simpson needed was the first strike. That wasn’t all Incaviglia covered in his speech, here is a synopsis from Holliday. “He talked to them about what made him, him,” Holliday said. “I think his message was loud and clear. He played for two reasons: he played for his teammates and his coaches, and he played for his program. It was those motivations that drove him to be an individually great player because he played on behalf of the guys around him, and he played on behalf of his program. Incaviglia is set to throw out the first pitch for Sunday’s rubber match. Freshman second baseman Hueston Morrill had a solid day. He finished 2-for-4 with two runs scored, and he drew a walk. In the fifth inning, he hit a double to the left side that found its way to the corner in left, and Morrill legged out a double. It wasn’t only what he was doing on the offensive end. He was also doing stuff like this on defense. Through 15 appearances, Ben Leeper has a .54 ERA and has given up only one run. In 1959, OSU’s national champion baseball team didn’t get rings, but they did Saturday. Before the game, players and family members from the Cowboys’ national championship team were recognized along the third-base line, culminating in current OSU players walking out and awarding the rings. It’s been a celebratory weekend for the 1959 team, as shirts based of the ’59 jerseys were handed out to fans Friday, and Saturday replica rings were given to the first 1,000 fans at the park. Sunday the squad will have an autograph session. Seeing them together is something to behold. Trevor Boone said he got goosebumps walking by the team in the dugout before Saturday’s game.